I've been on a bit of a computer fast this week; as soon as I decided I was going to really cut down my computer time on Wednesday, my computer stopped working. So. There you go. It has been a good thing but made it harder to post on the blog. I have been working on a few small things--a friend from church bought the supplies to make a bunch of blankets for Heart to Heart International and asked me to sew them up. I made 3 of them, and gave 3 more to another friend who said she'd help. This is the first time I've used the satin blanket binding, and it's not too hard, but it takes some time. What I did was trim the two fabric layers, pin the binding on one side, then go sew it. Then I went back and smoothed it out on the living room floor again and pinned the next side. Repeat until done. I did one each day for 3 days. I also made these blocks for Audrie who is the April gal in the bee beautiful group. 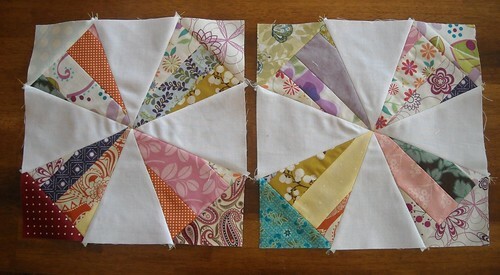 These seemed pretty easy at first, but when I put the last seam in the first block, it was a little unfortunate. I had to redo it this morning and it turned out better. The secret is to make sure the pieced sections really are exactly the size of the template before sewing. Anyway, they are done and they didn't take a lot of deep thinking which is good some of the time, you know? 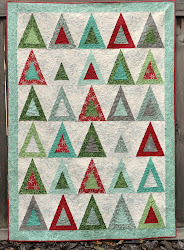 Speaking of online quilting bees... I saw this site on one of the blogs in my reader this afternoon. 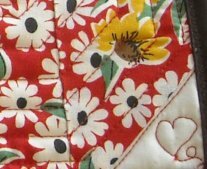 Quiltingbeeblocks.com is a site explaining virtual quilting bees--it has a directory of many of the bees that are going on, explanations of just what a virtual quilting bee is and how to start one, links to block tutorials and more. They also have a flickr group and they are having a big giveaway right now too! I'm looking forward to browsing the quilt blocks in the flickr group and seeing what so many quilters have been up to in their bees. And finally, just wanted to share a little sneak peek of something I made for someone. Going to get it in the mail really soon, I hope. I'll show the whole thing soon. You've been very busy! I just love those self binding receiving blankts. Very cute new header. 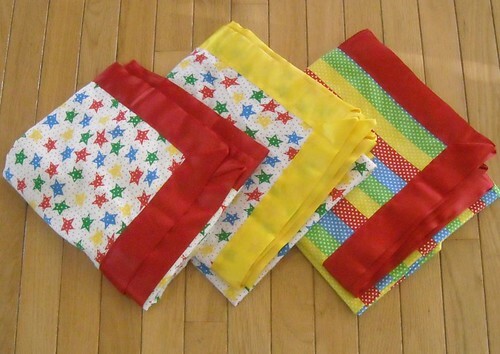 Love those bright cheery baby blankets you are passing on! Those little charity blankets with the satin binding turned out so cute and colorful. I like to put a satin binding on a fleece blanket -- quick and easy baby gift :D. Also, I've done those blocks like you did for your swap and they are deceptively tricky. YOu did a really nice job. Thanks for sharing!